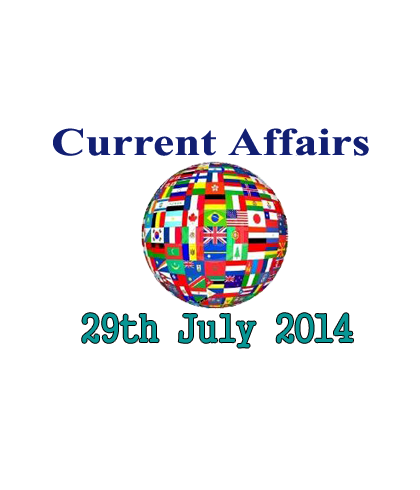 Latest news and current affairs about the country and world are listed here. Have a look on it and make use of it. Ø US Secretary of State Mr. John Kerry today told that, it was the right time to transform the bilateral relationship into historical partnership which will create more prosperous future for this world. Ø Gaza Strip’s only power plant that provides electricity was knocked out by Israeli shelling. Ø Eid-ul-Fitr was celebrated around the world today. Ø To save tigers and create awareness about the problems they faced, today was celebrated as International Tigers Day. Ø New connectivity between China and Nepal through Tibet will be open by this October and China has planned to increase the trade with Nepal. Ø The North Korean Shipping Company that moves a ship seized by Panama in July 2013, which United Nations has imposed sanctions due to carrying un authorized military goods from Cuba. Ø Mr. Narendra Modi The prime Minister of India has addressed the 86thFoundation day and award ceremony of Indian Council Of Agricultural Research (ICAR) which was held in New Delhi. And also he hailed all the farmers of India that, “Everyone one who works to the field for agriculture needs to give a standing Ovation. Ø Today the Power Minister of Haryana Mr. Ajay Singh Yadav has resigned his posting. Ø In 25 Meter rapid fire pistol event, Indian Shooter Harpreet Singh has won Silver Medal. Ø In 85 kg weightlifting, India’s Vikas Thakur has won his silver medal. Ø In Rifle 3 positions, Mr. Sanjeev Rajput has won Silver and Mr. Gagan Narang has won Bronze medal. Ø In 53 kg weightlifting, Nigerian Athlete Chika Amalaha, was failed in doping test after winning gold medal who got the name of youngest-ever female to win aged 16. Ø ICC warned, the England player Mr. Moeen Ali not to wear wrist band that supports the people of Gaza, in this international matches.